Genuine Evolis R2214 monochrome green ribbon. Monochrome ribbons are ideal for printing text and single color line art on cards. 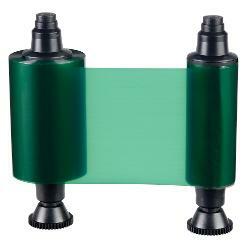 The color ribbon is polyethylene terephthalate (PET) with a thin layer of specialized coating. The concentration of colorant is very low and they are insoluble in water. In the printing process, they only diffuse at the temperature above 50�C. Compatible with the following Evolis ID card printers: Evolis Tattoo and Tattoo 2 printer series.